As occurs often, an MV-22 Osprey flies over a residential district by MCAS Futenma in Ginowan City in September 2018. 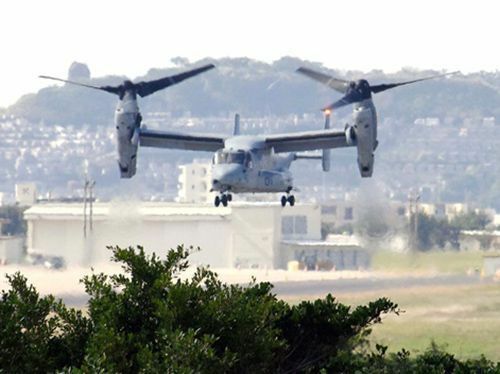 Just past 1:55 p.m. on April 1, an MV-22 Osprey vertical takeoff and landing aircraft from Marine Corps Air Station Futenma made an emergency landing at Osaka International (Itami) Airport in Osaka Prefecture. There was no damage to the fuselage, and the aircraft drove off the runway and onto the parking apron. On March 27 another Osprey from MCAS Futenma made an emergency landing at Okinoerabu Airport in Kagoshima Prefecture. This model of aircraft continues to experience trouble in Okinawa, such as in December 2016 when an Osprey crashed on the shore in Abu, Nago City.